So i'm new to the whole reverse engineering thing with only experience in C#. So I wanted to try and change the framerate of applications (eg. this unity game) at an assembly level on iOS ( I have an 120hz iPad pro so I find it really important.) Therefore to learn how this was done I decrypted the binary of my very own app on the app store and then compared it with the C++ code that is created when unity exports to Xcode. Note the highlighted area and the value of 120 (the framerate). This is in C++. But now in assembly note how the value is simply "System.Int32" Soo what happened to it? Maybe it's something to do with the /hidden argument/ in the C++ code? but for other apps I obviously won't have access to that. I'm still new to this and i've been trying to learn the basics of assembly. I'm just baffled as to what I should do and how the value can be changed? If someone could explain how to do so that would be great. If not a helpful pointer as to what I should learn and do next to solve this problem, maybe links to articles would be also helpful. Thanks in advance. 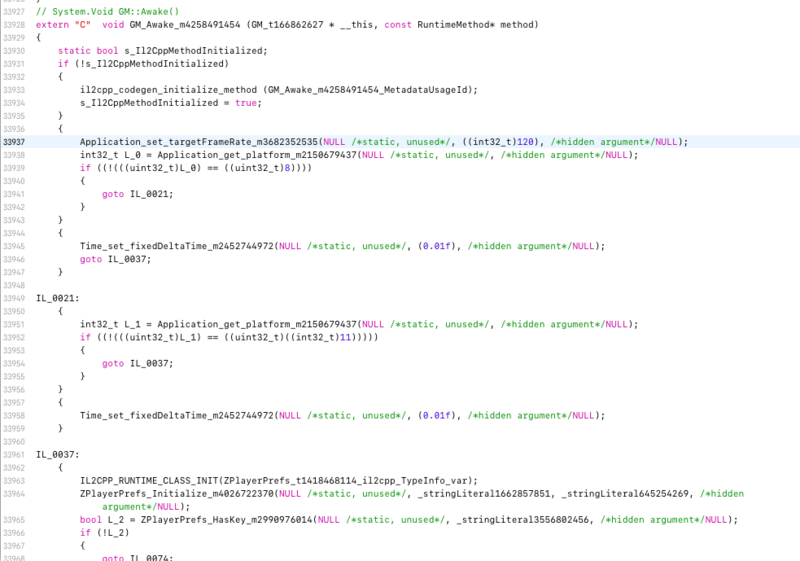 What you see in your assembly is in fact calling the setter (thus set_targetFrameRate). And as those are not method, there can only be one value that is passed to them (or assigned as in C# code they look like normal assignment operation i.e. TargetFrameRate = 120). Of course Obj-C/Swift and C++ are different and does not support those so that have to be mitigated and for some reason they were coded like that (method & more than one value). So there is no issue that you see only one argument that set_TargetFrameRate takes. 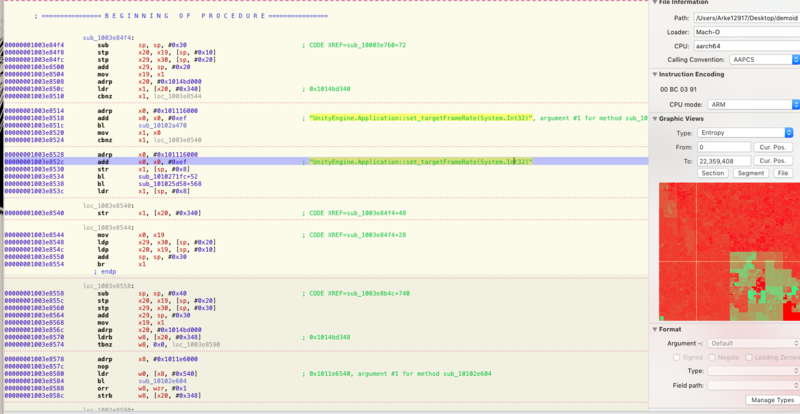 Since it has an InternalCall & extern you would need to dig a bit deeper to get to the actual implementation. Not the answer you're looking for? Browse other questions tagged arm ios binary . Will jailbreaking affect file system accessibility for all apps?